Treat her to diamonds with the pretty diamond cluster ring from Cherished. 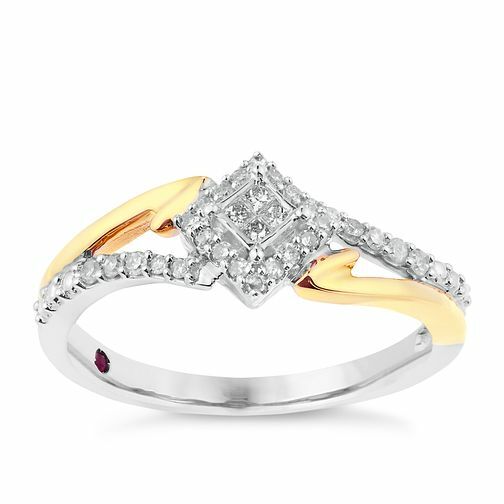 Crafted in sleek argentium silver and finished with warm 9ct yellow gold shoulder detail for an added touch of contemporary style and luxury, this elegant ring features a square, princessa style diamond cluster at its centre, with diamond set shoulders and a secret ruby for happiness. Cherished Silver & Yellow Gold Square Diamond Cluster Ring is rated 5.0 out of 5 by 2. Rated 5 out of 5 by Anonymous from Beautiful Love this ring the more i look at it. Has beautiful attention to detail. Looks expensive and elegent.